So this is the start of my second ‘On my travels’ quilt following the 13 month long previous project. Again I will only or let’s say mostly work on this whilst on my frequent travels. I so much loved the EPP process that I will stick to it but this time I am going for something more complex and will create giant hexagons from 3 different shapes. I got the idea from Clare from selfsewn. Clare frequently makes the most gorgeous quilts from EPE shapes and one of them is a quilt called ‘Summer of Love’ that is absolutely stunning. I saw the shape I have chosen for my new project on one of her tutorials for fussy cutting. I followed her clear instructions to make templates for the 3 individual shapes but omitted the slim border around the giant hexi. Then I dived into my fabric scraps and stash to look for something suitable. This little assembly above is made using K. Fassett fabrics and I think some J. Dewberry and was sewn together on a relaxing train ride 2 weeks ago to visit friends in Cornwall. 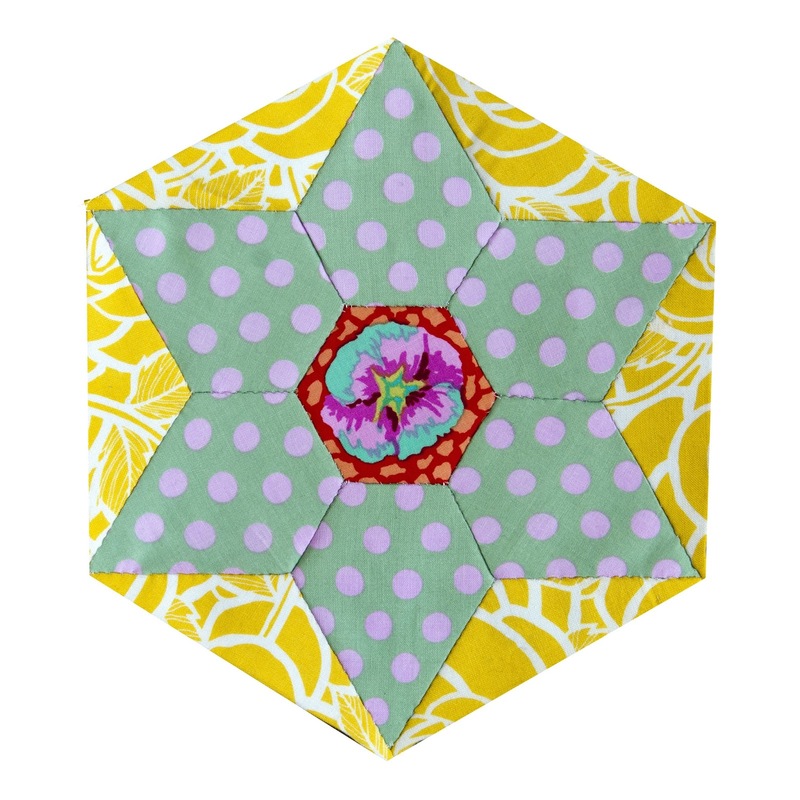 I love fussy cutting and will attempt to use in each and every giant hexi at least a fussy cut shape for the the inner hexagon if not for the diamonds too. Oh I love that fussy centre! Beautiful! That's beautiful - I'm looking forwards to watching it grow. I love the original quilt that inspired Clare's version too.